Reiki is purely Japanese. There are some writers and Reiki masters who have attempted to infuse Western ideas into Reiki. There are others who have tried to imbue it with “new age” ideas that it does not possess. This view is completely unnecessary, and risks causing not only confusion among students but dilution of the practice of Reiki itself. The purpose of this course is to provide the student with detailed theoretical information concerning the history, usage and application of Reiki. At the end of the course, a supplement is sent to you from our tutor and course writer Tony Edwards. This is entitled ‘The Last Secret of a Reiki Master’, enabling you to attune yourself and others. 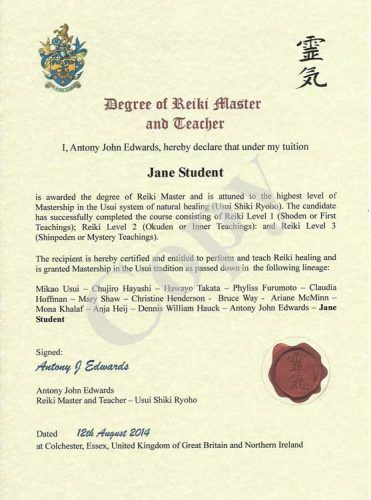 Your final level of achievement will be Reiki Master and Teacher. The Course will be Tutored by the course writer, Antony Edwards DHyp DHP MA FRSH MIAH MBIH LAPHP, SAC (Dip. Adv. Psychotherapy). Tony is a Reiki Master in the Western lineage going back via Claudia Hoffman …Phyllis Furumoto … Hawayo Takata … Chujiro Hayashi … Mikao Usui. A sample of the lineage diploma can be seen here on the right, (fee £50). This is an additional option to our accredited Diploma which is included on our course fees.